• Minimum working width 200mm, maximum thickness 60 mm. • Chain with shielded bearings and variable forward speed electronically from 6 to 18m / min. • Distance between pins 380 mm and prensor with rubberized belt and acoustic protection..
• Opening and closing motor with electronic programmer measures. • Adjust the height of the engine. 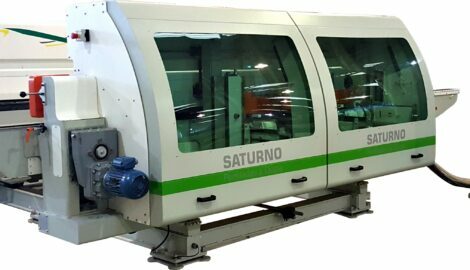 • Sturdy frame, welded, machined and locked with pins, ensuring the parallelism and the square of the machine. • Displacement of the moving amount of linear guides. • Positioning mobile amount per ball screw with lock system (brake motor), ensuring high measurement accuracy of the panel. • leveling system bus with support shoes. • Axis tree SAE 1045 rectified material. • Cubes mobile teflon coated amount. • Crown with Spiced teeth. • Automatic System survey of squares pins. • individual rubberized shoes ease of exchange in case of maintenance. • Seasoned guide pins and ground closing 100% square. • Assembled with orin’g ring isolates the passage of dust. • Current machined, rectified and heat treated, ensuring parallelism and the current resistance. • High dimensional accuracy of links of the chain, shown at the perimeter of current while maintaining the precision of up to 0.02 mm. • Stretcher with a spring system, which eliminate gaps during movement. • It reduces the need for periodic maintenance of the machine belt. • Ensures faster adjustment of pins programming. • Prensor with Vertical belt. • belt system (belt) rubberized guided with two (2) channel in the V, hardness 40-50 Schore A. • Beaded belt, ensuring better grip to panel drive at high speed. • System arms with springs dimensioned for pressure control. • Ensures accuracy and rapid positioning of the vertical prees group. • It makes a channel at the bottom of the panel to avoid breaking off the crusher tool. • 02 Crushers with 15cv engines, 6000 rpm, 200 mm tool and, bore 40 mm. • With an inclination of 0 to 90, mince panel material surplus. • 02 fixed Tupia with engines 7.5 hp, 8000 rpm, tool 150 mm and 40 mm in diameter. • Inclination of 0 to 90, the tool rotates in the opposite direction of the Automatic Router to avoid breaks in the output. • 02 Automatic Routers wich motors 7.5 hp, 8000 rpm, drill tool 150 mm and 40 mm. • Inclination of 0 to 90, the tool rotates in the opposite direction of the Fixed Router to avoid the drop in output.